DETROIT – Corvette Racing Program Manager Doug Fehan is presented with the Spirit of Le Mans award today from the Automobile Club de l’Ouest – the sporting authority of the 24 Hours of Le Mans. Fehan, who oversees the Corvette Racing program on behalf of Chevrolet, received the honor the day before the start of the 82nd running of Le Mans. The Spirit of Le Mans award is presented annually by the ACO to the person who has been instrumental in the growth in stature of the 24 Hours. Fehan has been the program manager for Corvette Racing since its debut in 1999. 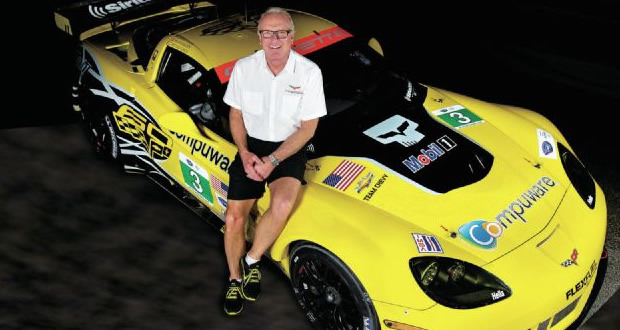 Three years earlier, he and former GM Racing executive director Herb Fishel –- a Spirit of Le Mans recipient in 2003 – helped put the plans in place to launch Corvette’s return to professional road racing in 1999, and the program debuted at Le Mans in 2000. A year later, Corvette Racing captured the first of its seven class wins at Le Mans. “I am deeply honored and grateful to receive the esteemed Spirit of Le Mans award,” Fehan said. “To be in a group that includes some of endurance racing’s most famous names is extremely humbling. Corvette Racing debuts the Chevrolet Corvette C7.R this year at Le Mans with a two-car attack in the GTE Pro class. Antonio Garcia, Jan Magnussen and Jordan Taylor will drive the No. 73 Corvette with Oliver Gavin, Tommy Milner and Richard Westbrook manning the No. 74 Corvette. Corvette Racing will go for its eighth class win at the 24 Hours of Le Mans since 2001 at 3 p.m. CET/9 a.m. ET on Saturday, June 14 with live coverage across FOX Sports 1, FOX Sports 2 and the FOX Sports Go app. Live in-car video from both Corvette C7.Rs and a Corvette Racing garage cam will stream throughout the race at foxsports.com. next Congratulations Corvette Racing - 2nd and 4th Place in LMGTE Pro Class! Rob Loszewski Robert M. Loszewski is the Owner and Site Administrator of the Corvette Action Center; a quality-driven Corvette news and information web site that he started in 2000. Over the years, Loszewski has built the Corvette Action Center into one of the largest online repositories of Corvette information going all the way back to 1953.